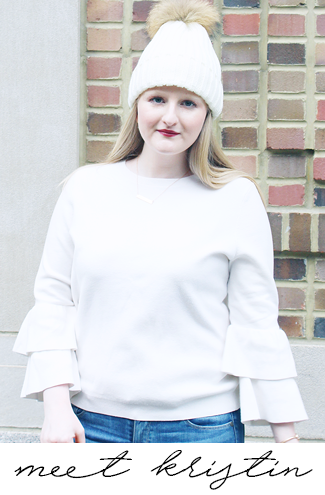 With finals and the Holidays, and all the craziness that comes with that, I haven't had the chance to do an Instagram recap in quite a while! Instagram is my favorite form of social media and I love sharing my life through it. Today I'm going to show you what I've posted over the last month. You can follow along at @crumbsandcurls - comment on one of my pictures that you're from here and I will be sure to follow back! My Family ended November by putting up our Christmas tree! Unfortunately I was only there to see it up naked, but that made it all the more exciting when I got home for Christmas to see it beautifully decorated. My Mom really did a great job putting it together and decorating the house for us! I love to kick off the holiday season with fun Christmas nails. Maroon with a gold sparkle nail is my favorite combination for this time of year. It makes me feel extra festive and getting a manicure is a nice break from all the end of the semester stresses. I wrote my last paper of the year on Taylor Swift's music video "Blank Space." I had to discuss symbols in a music video and this was the perfect choice, it was a bonus that I love the song too! It felt so good to be done with papers for the semester and one step closer to break. My philosophy for finals was "dress well, test well," and this was the first day of exams. An oversized sweater and leggings is my go to look in the winter when I want to be cozy, but look chic. I think looking cute is what helped me to successfully make it through finals! After my last final I took a nice long nap as a reward. My nap essentials are a sleep mask, lip balm, and hand cream, and a few uninterrupted hours of sleep! It felt so good to be able to rest after I was finally done and to not have anything to worry about. Coco is a huge fan of our Christmas tree. We often find her staring at it, which I think is too cute! My sister took this picture the night before I came home for break and sent it to me to show me what Coco was doing. It's my favorite picture from this past holiday season! I'm a huge fan of my school's basketball team and watch every game I can. This game was against one of our old Big East rivals - Syracuse University, and one of my favorite games every season. This year we we won in overtime, which made me so happy. Watching the game at home with the Christmas tree made me even happier! It felt so festive and was a great day for Nova to Juice 'Cuse! My Mom ordered a large copy of my composite so that she could update her frame from my high school Senior Portrait. Getting this in the mail felt like I was back in high school and my school pictures just came in. I'm sure when I'm done with school and am an Alpha Gam Alum I'll be very happy that she chose to get a few copies to commemorate! I baked a lot of Christmas cookies before the big day. This is my favorite time of year to bake because it's really the only time I roll out cookies, which is so much fun. I have so many really cute cookie cutters and I love getting to break them all out. I think it makes the cookies extra special when you only make them once a year! My sister and I exchange Christmas gifts on Christmas Eve when we get in from where we were celebrating; it's a tradition that we started when we were little and has lasted many years. My sister got me gorgeous rose gold monogram earrings and this adorable sweatshirt. I'm obsessed it since it goes so well with my tagline for here, "Stay Classy and Sassy." I decided I needed a picture in it with Coco right after I got it. A few days after Christmas I went to get my haircut and decided to take off 4 inches. I was inspired by Lauren Conrad's cut before she cut her hair into a short bob. I wasn't initially planning on taking off 4 inches, but one of my medications had done some damage to my hair and the ends were really dry as a result. Now my hair feels so healthy and I love the results! On New Year's Eve I got to take my Mom to her very first Villanova Basketball game. Tickets for the games are usually nearly impossible to get, but during the Christmas break they make the unused student seats available. For the past 3 years my Dad and I have gone to the games over break, but my Mom was never able to come. I was so happy to finally be able to bring her and the fact that we won made it that much better! My Dad is a huge Villanova Basketball fan so of course he came to the game too! It was so much fun to spend the day with my parents at the game and share that with them. I had a really great time! This past Saturday my Dad and I watched the basketball game at one of his best friend's house. His family has the sweetest Cavalier King Charles Spaniel named Molly. She is so cute and cuddled with me the whole time I was there. I couldn't not take a picture of her! This was a little preview of my last month in pictures. From looking at these pictures I'm sure you can see just how much I love Christmas time and my school. Head over to my Instagram (@crumbsandcurls) to see pictures like these and more! Haha too funny about Coco! I am sure the decorated tree looked so pretty! Love these insta shots! I hope you are enjoying the new year so far! I love going on instagram during the holidays since I can share and see cool pictures. Great photos! :D Have take a look at my site? Let me know if you did. Hope you can follow my blog.